One of my favorite things to do in a new town is to get lost. Just start walking or driving until you have no idea where you are, then find your way home. Typically, this isn’t as scary as it sounds. You stay out of dark alleys, keep main roads nearby and use the signs and known landmarks to guide your way back. I headed out for my first big walkabout on my own. To be fair, I actually started out looking for the train station with the plan of taking it to Kawagoe Station to get Starbucks, but I’m hardly the first person to have a spiritual journey on their way to buy overpriced coffee. I passed the Belc grocery store and the 100 Yen Shop (the current exchange rate is about ¥100 to $1, so it’s like the Dollar Store only way, WAY better). I bucked temptation, passing more than one of Kawagoe’s many patisseries. And I kept walking… and walking… and walking. I realized I was missing a few tools from previous treks. First, the lack of a smartphone, GPS, Google Maps, internet, etc. makes you wonder how smart you actually are without these things. All of the buildings are two stories or higher, so it’s hard to find landmarks at a distance. The roads dance about like a ballerina, resulting in a bizzaro world of directional dissonance. Second, very few of the street signs are in English. Every once in awhile, the fine folks at Kawagoe Public Works throw you a bone and give you a street sign in both Japanese and English. It’s just enough to recalibrate your path. Finally, I left my water and snacks at home. It was high noon, 70 degrees, and very sunny. Fortunately, the ever-present vending machines appear every few blocks like some desert mirage. I had a pocket full of yen, so I was able to replace electrolytes in the middle of neighborhoods, street corners, parks… really, pretty much anywhere. You tend to find very interesting things on these kinds of journeys. Kawagoe has several excellent paved paths surrounding recreational areas. In between two of the paths, a long field featured soccer and softball fields as well as an epic putt-putt golf course. 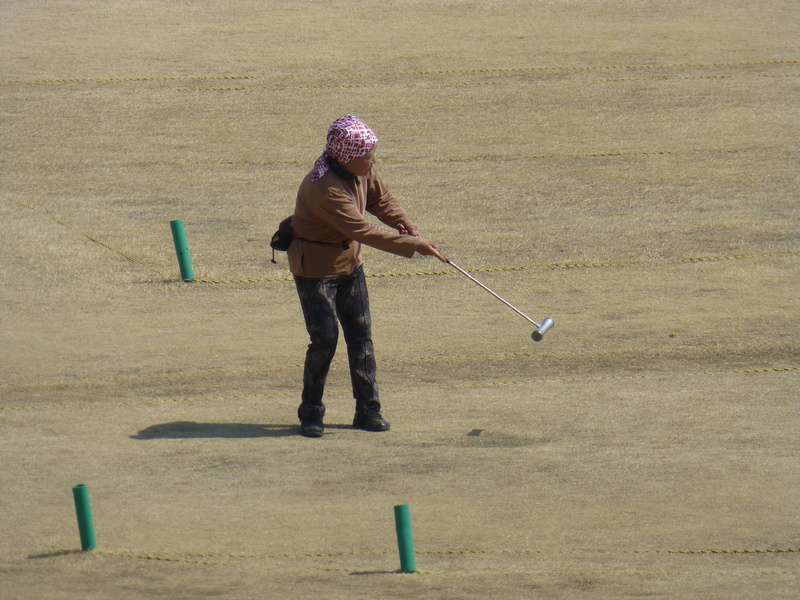 Four players used croquet mallets and balls to putt the ball from tee to cup on an 18-hole course. 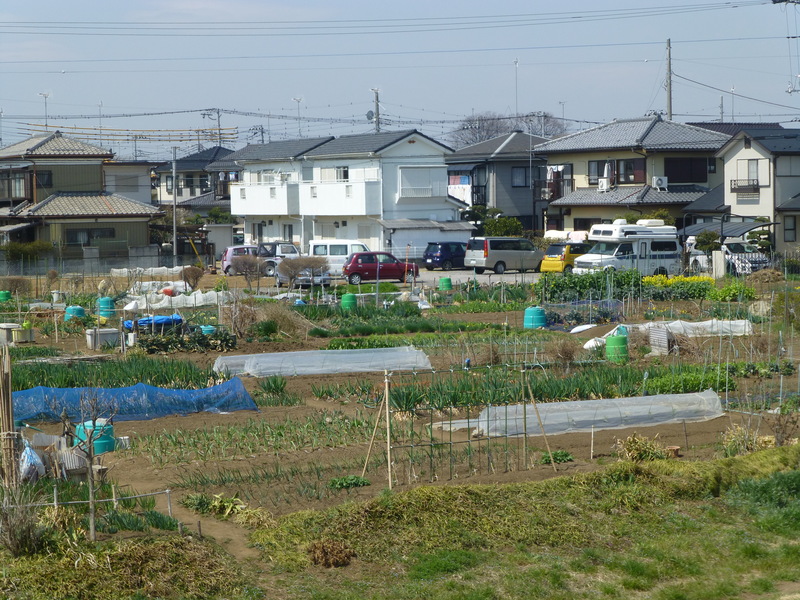 Community gardens, fantastic public park spaces and small shrines pepper the city’s neighborhoods. Some of the shrines are larger and supported by community donations while others seem to be built and managed by nearby homeowners. The parks are an interesting contrast of brown, dead-looking grass and brand-new playground equipment, tennis courts and picnic tables. The biggest surprise of all is my growing fascination with Japanese mailboxes. I find myself snapping pictures of them left and right. Some are traditional, some playful, but rarely boring. At this point, every trip out of the house results in a walkabout. Can’t wait for the next opportunity to get lost! I’ve done the same in many cities. And there’s a big difference between wandering around London where you can read the signs and places like Budapest, Prague, Berlin, etc where all the signs are in a language you haven’t studied and all you have is a little tourist map to keep you orientated. But like you say, as long you stay out of dark alleys and keep to main streets you’ll have a grand and interesting time. You’re making me want to jump on a plane for a another adventure.